Parents: Here is How to Help Your Kids Take Care of Their Braces! Wondering how you can get your kids to take care of their teeth while they have braces? What can you do to get them to brush and floss regularly? Are there certain foods that your kids should avoid while wearing braces? Excellent questions that our patients and their parents ask us quite often. So we’re here to tell you some tips and suggestions for how you can help your kids take care of their braces. Join us!
? I’ve heard that, when you have braces, you need to watch what you eat. Is that true? Yes, there are certain foods that you cannot and should not eat when you have braces. Following this “rule” will help you take care of your braces as best as possible. 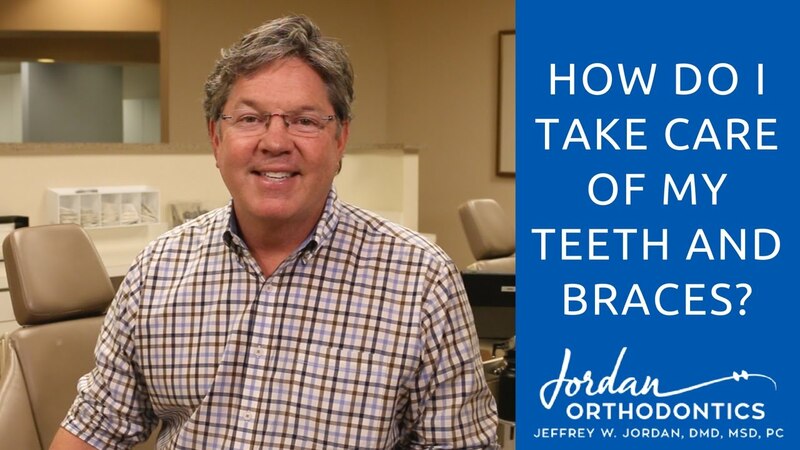 Dr. Jordan will explain all of this to you prior to getting your braces, and he’ll even give your kids a comprehensive list of foods to avoid. Additionally, minimize sugary foods and beverages as much as possible. Now we don’t want you to avoid eating raw vegetables altogether—that wouldn’t be very healthy! Instead, cut up your vegetables into small pieces so they’re easier to bite and chew. We’ll give you even more tips in our comprehensive instructions prior to getting braces! By following our instructions to take care of your braces, you’ll likely avoid most emergency appointments to repair damaged or broken braces.
? How often should your son or daughter brush his/her teeth while in braces? Adults and teenagers who want to take care of their braces and teeth as best as possible should brush their teeth at least four times each day. It is very important to brush them after each meal and before going to bed - at the bare minimum, of course. You need to remove the food particles and plaque that get left behind after you’re finished eating. Flossing plays a big role in this. Be sure to floss at least 1 to 2 times per day, paying special attention to each tooth. When you first get your braces on, we’ll show you how to properly floss your teeth with braces on.
? What are the best oral hygiene practices for kids who have braces? Dr. Jeffrey Jordan recommends several techniques and practices for kids to properly take care of their teeth and braces. One recommendation is using an interdental toothbrush. It is used to clean underneath and around the wires and braces in order to remove food debris and plaque. Another recommendation is using an antibacterial mouthwash. Rinsing your mouth with an antibacterial solution will help to prevent infection and decrease irritation that can occur while wearing braces. You just need to follow the instructions on the bottle. If you need a recommendation for the type or brand of antibacterial mouthwash to buy, ask Dr. Jordan and he’ll give you some advice. The third recommendation is to use a topical fluoride to help prevent tooth decay by killing bacteria and replacing minerals in the tooth enamel. If you need fluoride treatment, Dr. Jordan will make this recommendation (some patients need extra fluoride, but others do not). The last recommendation for kids who want to properly take care of their braces is to clean your removable appliance, if you have one. Not only will the appliance taste better, but daily rinsing will prevent plaque and bacterial accumulation. It’s important to see your dentist and orthodontist regularly when you have braces. Your orthodontist will check your braces for bent or loose wires and brackets. In the event of a loose/broken wire or bracket, call our office immediately to arrange an appointment for repair. To read more about orthodontic emergency information, visit our emergency information page. Have questions? Need an orthodontist in the Alpharetta, GA area? Call Jordan Orthodontics today for your appointment.